I absolutely love metallics! You always look so good in them too, they go perfect with your beautiful skin! 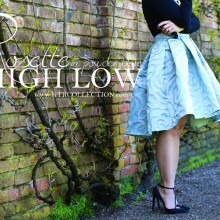 gorgeous skirt and totally obssesed with those shoes! I love that shirt….such a cute crop and that skirt is absolutely fab! Absolutely stunning look, especially that skirt and bag I love. I adore this look, your skirt is everything and I adore your pairing with the cropped blouse.